WILLIAM HALL, entered on 8 May 1913, age 14, reason given as mother unfit to have control. To be placed on TS Exmouth until the age of 18. LAURA HALL, entered on 8 May 1913, age 11, reason given as mother unfit to have control. To be put to domestic service until 18. ROGER HALL, entered 30 Dec 1913, age 15, no reason given. To be sent to TS Exmouth until 18. Now I say this was the decision which made my great uncle into a British Home Child. It comes from a report which a colleague found in the records of the Derby Poor Law Union. Not much of the archive has survived and the background to how the authorities got involved is lost. But it will be familiar to many and continues to be replicated to this day. Now I say this was the decision which made my great uncle Roger into a British Home Child, but to be fair it was only one of the steps. His mother had returned to Derby in 1902 to give birth to her last child in the Derby Work House having separated from my great grandfather. 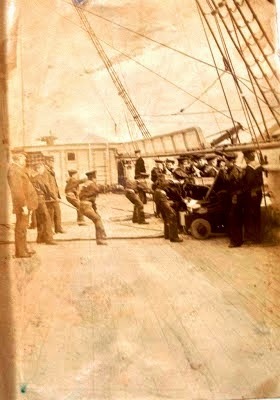 Both my grandfather and great uncle were placed on a training ship which was really a naval boot camp for wayward boys. 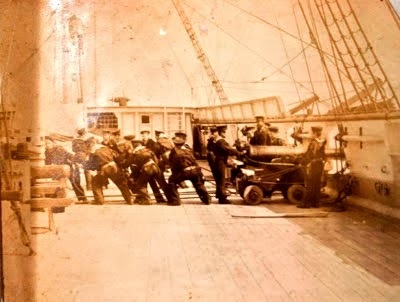 Here they were taught seamanship in a strict environment, but for whatever reason great uncle Roger declined the placement and I can only think the Poor Law Guardians either decided or offered him the alternative of a passage to Canada. All of which makes the reasons for his arrival in Canada a little different. He was not homeless nor was he an orphan and there does seem to have been some attempt to keep here in Britain and not foist him off across the Atlantic. And judging by what his sister said over sixty years later both he and my grandfather were running wild and were challenging children. The part played by my great grandmother is unknown. There is evidence that both her and my great grandfather were themselves challenging adults, and separated leaving her to bring up three children under the age of five while having their last child on her own in the Derby Work House.